What is iexplore.exe? Should I remove it? iexeplore.exe is a legitimate file, which belongs to Microsoft. This file is considered a part of the Windows operating system and it mostly works on helping people to connect to LAN or the Internet. iexeplore.exe is also known as Internet Explorer or Microsoft Internet Explorer; its default location is “C:\Program Files\Internet Explorer” and known sizes are 93,184 bytes or 638,816 bytes. On rare occasions, iexeplore.exe can be discovered on the system after installing Adobe Flash Player or Super DVD Creator. There are hundreds of various discussions on the Internet where iexeplore.exe file is called malicious. That's because malware creators use names of legitimate files in order to deceive PC users and hide their own viruses. For example: iexplore.exe filename has already been used by hackers who spread Trojan.KillAV.B, Power Key Logger, Cosdoor, Lecna, DarkSky Trojan, Boxer Trojan and many other dangerous viruses. 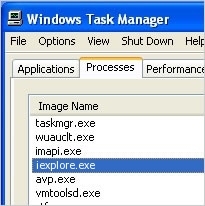 In this case, iexplore.exe works as a file, which is responsible for launching parasites, loading their components and running a destructive payload. Нужно ли мне удалить iexplore.exe? Definiere Datei iexplore.exe. Brauche ich es? This entry was posted on 2014-04-18 at 07:34 and is filed under Files, System files. You can quickly scan the QR code with your mobile device and have iexplore.exe manual removal instructions right in your pocket.